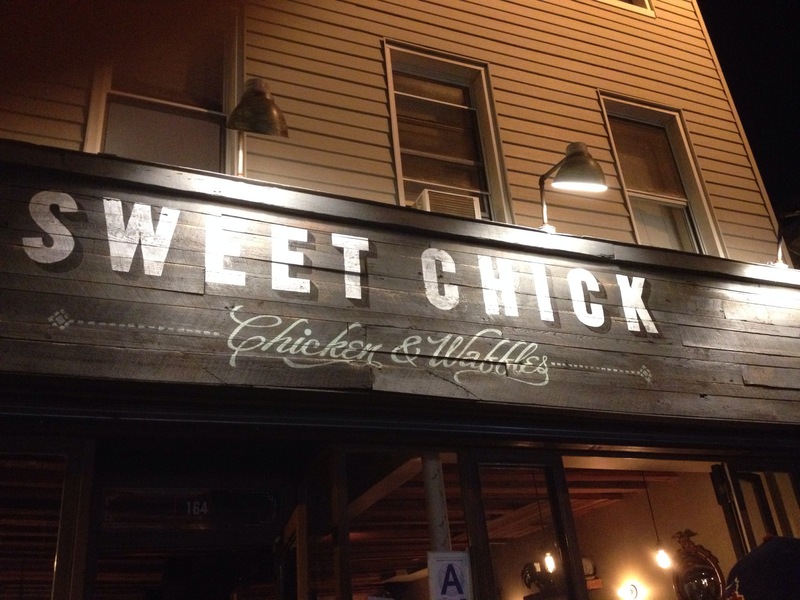 Ok, so I hear about this restaurant in Williamsburg also known as Brooklyn, New York called Sweet Chick Chicken Waffles and immediately I felt a sense of pleasantry and intoxication all wrapped up into one. Then I began to think, is this another restaurant trying to bite off of Roscoe’s Chicken & Waffles on the west coast, are they trying to pull a fast one on these east coasters by making them think their waffles can be as good; well only way to find out for sure, is to go see for myself and attempt to chow down. As I perused through the menu I wanna order everything and not because I think I can eat it all, but I just simply got beside myself on what to pick, should it be the mac & cheese, should it be the shrimp and grits, or should it be the pork belly, who can decide? 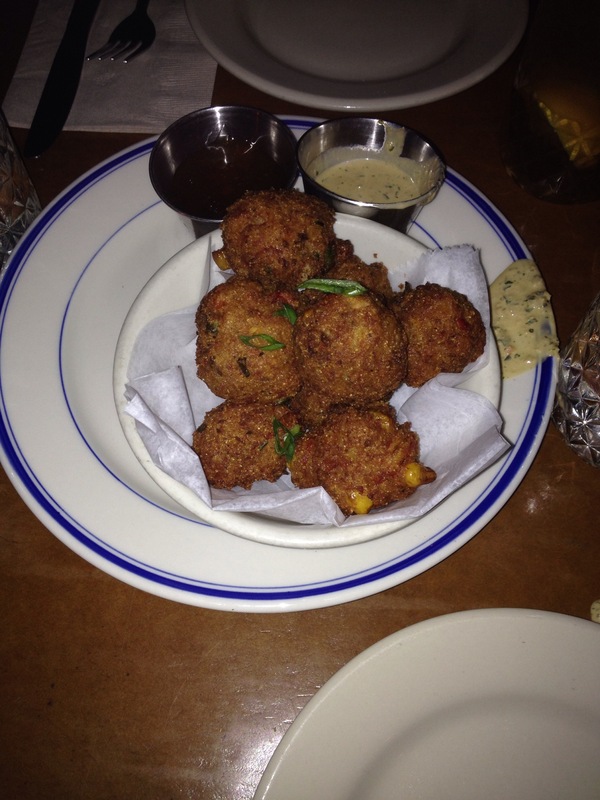 I can decide thats who, so I start with the crawfish hushpuppies and my Lord what a winner it was. It has been so long since I had a hushpuppy, but my memory brought me back to a fried dry cornmeal ball, that really has no elements of being delicious, so why did I pick it since there was no association of jubilance? simply put the waiter recommended it. These hushpuppies were turned up, simply because Sweet Chick said “turn down for what.” They were packed with sweet crawfish, they were fried nicely, and most of all they were moist, and when you dipped them in the romoulade sauce, an explosion of flavors transpires in your mouth, and simply causes your your hands to clamp together and thank God that He infused the chef with such an idea and skill set. Next up the fried chicken and waffles; sure this is common choice and predictable for me to order, but nevertheless a preeminent choice. Never in my wildest dreams could I have asked for a better belgian waffle, it was so fluffy, light, with a backdrop of sweetness, that I am positive that I ate more than I should, simply because it was so light I didn’t even remember that my caloric intake had reached its max. I always think finding great fried chicken is a feat all its own, sure the chicken can be crispy, which this was, and sure it can be juicy, which this was, but somewhere in the flavor category I missed something. It has always been my theory that when making fried foods it ls imperative to super season or at least to season enough to penetrate the fried shell and to do this can often be a difficult task. However the fried chicken did have something that was reminiscent of home cooking and that was, rosemary. Rosemary is my favorite herb it is not only aromatic, but it is very warm and earthy, and always adds something extra to any meal. 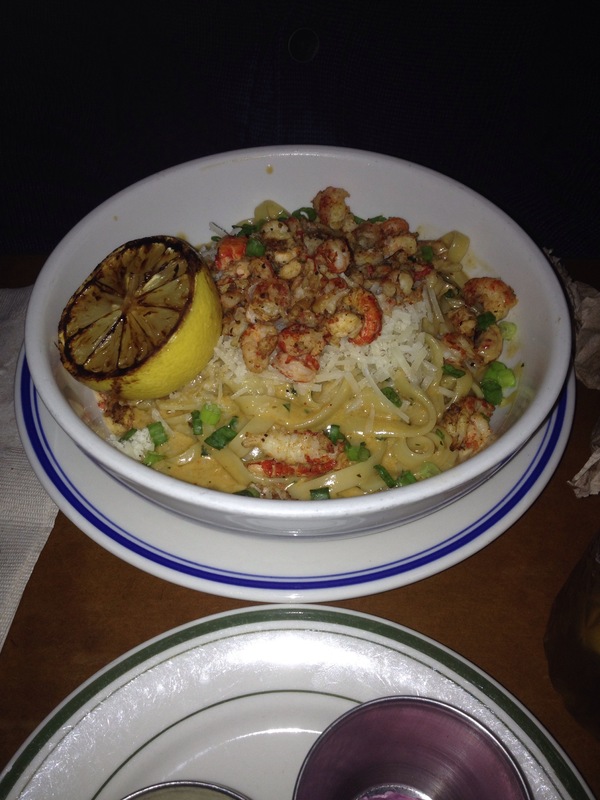 Last up was the Fettuccine Crawfish Monica…translation mouthwatering. The crawfish was grilled, the sauce was creamy and decadent, it was seasoned to perfection and no additions were required, and the noodles cooked with exactness. Each time I go out to eat, I am always looking for the closed eye, shake your slowly, with a slight hum moment, and this pasta delivered all of those like a charm. 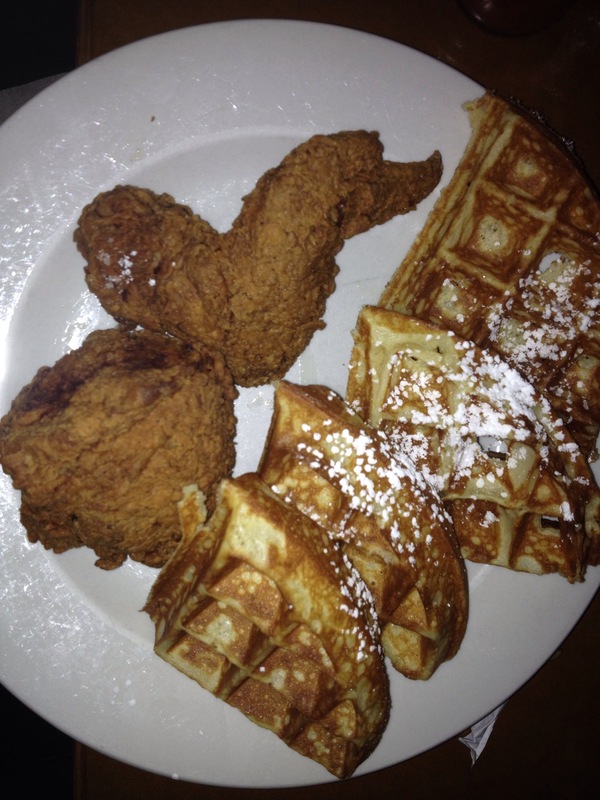 So no Sweet Chick is not like Roscoe’s Chicken & Waffles, it is not even in the same category, it stands alone in its own delectable circle, and I feel absolutely privileged that they allowed me to join in, well done Sweet Chick, well done!! Mica, Wonderful writing as usual. I always feel every sensation. But (the motherly side), please proof read. We are going for the Big Time here!! !